The state’s largest rural fair here saw Chief Minister Parkash Singh Badal and Congress leaders indulging in mud-slinging and trading charges against one another. The SAD-BJP alliance put up a good show with supporters of almost all candidates for the SGPC elections bringing a large number of activists to the conference. PPCC president Capt Amarinder Singh and CLP leader Rajinder Kaur Bhattal have condemned the lathi charge on unemployed youths at the Akali rally at Chhapar Mela in the presence of the Chief Minister. Targeting his bête-noire Captain Amarinder Singh and the Congress, Deputy Chief Minister Sukhbir Singh Badal has advised Capt to suggest the Congress-led UPA Government to follow the footsteps of the SAD-BJP Government by implementing the people-oriented Right to Service Act to curb corruption at the national level. The SAD chief made a whirlwind tour of most parts of the Doaba region and held a couple of rallies in favour of the SAD-Sant Samaj candidates at Sultanpur Lodhi, Nadala, Kapurthala and in Jalandhar cantonment today. Three schoolchildren, including two siblings of Malawi Devi School in Nakodar, were killed when the van they were travelling in was hit by the DMU train heading from Lohian to Ludhiana at an unmanned railway crossing at Mouwal village near here. Assistant Pastor in a church, Joel Johan Bhatti, of Mauwal village in Nakodar had never thought that God could be so unkind to him. The middle-aged cleric lost both his kids in an accident that took place this afternoon at an unmanned crossing in the village. After a Sharjah Appeal Court today waived their death sentence in the Mishri Khan murder case, 17 Indian boys, 16 from Punjab and one from Haryana, are set to reunite with their families back home early next week. Relatives of the convicted youths outside Sharjah’s Appeal Court on Monday. The BJP has decided to take up with its alliance partner the issue of keeping out BJP strongholds from a Rs 317 crore urban development grant. Punjab’s BJP president Ashwani Sharma said the BJP would shortly discuss the issue within the party and then take up the matter with the SAD leadership. “The pace of development will not be allowed to slow down and the BJP will ensure development of all areas, urban and rural,” he emphasised. Almost a year after the names of six advocates were recommended for elevation as Punjab and Haryana High Court Judges, the President of India has cleared the list. A fax message to this effect was received by the High Court this afternoon. 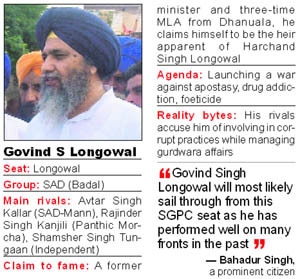 Seeking to encash into votes his association with the late Sant Harchand Singh Longowal who enjoys considerable respect in the area, Govind Singh Longowal, former minister and three-time MLA from Dhanuala (of which this area used to be a part), is testing the SGPC waters for the first time. Having contested successfully the last two elections from the Gidderbaha SGPC constituency in 1996 and 2004, Gurpal Singh Gora is trying his luck for the third time. But unlike the earlier elections, Manpreet Badal, People’s Party of Punjab president who used to represent the constituency in the assembly, is no longer associated with the SAD (B). Three persons have died due to malaria in Chailaila village, 15 km from here, in the past one week. The deceased include 35-year-old Karamjit Singh and her 9-year-old daughter and a woman, whose identity could not be confirmed till the filing of the report. Earlier scheduled to start from August 15 last year, the “Panjdeep” project will start functioning from November this year. Under the project, all the dispensaries covered under the ESI Corporation will be computerised. After withdrawing agitation on the assurance of Punjab Education Minister Sewa Singh Sekhwan, members of the 134 retrenched clerks of the Punjab School Education Board (PSEB) today again sat on a relay fast outside the office of the Board in Phase 8 here. “Irritated over the promise given by the Education Minister that the issue of their reinstatement would be cleared in the Cabinet, we have again sat on dharna,” said Yuvrak Krishan, who was made to end his fast last time by the Education Minister. Even after one month of Departmental Promotion Committee (DPC) meeting for the promotion of masters as headmasters, the Education Department is yet to promote them. The teachers are clueless as to when the promotions would actually be done. These teachers have been waiting since years and this further delay is a cause of concern for them. The number of cancer cases is less in Punjab as compared to most of the other states in the country. This was asserted by various speakers at a seminar organised by the Punjab Pollution Control Board (PPCB) here today. Nearly 17 years after the Beant Singh government in Punjab appointed Social Education and Panchayat Officers (SEPOs), the Punjab and Haryana High Court has upheld the selections. The police has arrested one more accused, Rajbir Singh Bajwa (alias Raju), in the infamous murder case of Canada-based NRI Gurinder Singh Gill. Reiterating that Congress leaders were interfering in the religious affairs of the Sikhs through leaders of the Panthic Morcha and the SAD (Longowal), Badal dared Punjab Congress chief Capt Amarinder Singh to contest from any of the SGPC constituencies. He said the Congress leaders were rattled at a large number of organisations, including the Kisan Sabha, joined hands with the SAD. 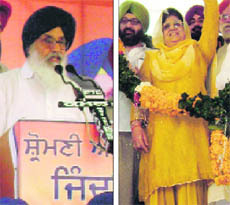 “While the Congress leaders, including Capt Amarinder Singh, have only one agenda, that is to appease Sonia Gandhi, we are committed to following the tenets of Sikhism and according due recognition to the sacrifices made by those who laid the foundation of the Panth,” said Badal, adding the party had no place for “maharajas”. Legislators Darshan Singh Shivalik, Iqbal Singh Jhoondan, Manpreet Singh Ayali, chairman, Zila Parishad, and former minister Jagdish Singh Garcha were among those who addressed the rally. Congress Legislature Party leader Rajinder Kaur Bhattal, Congress MP Manish Tewari and JS Khangura criticised the “non-performing” SAD Government. They said the corrupt Badal Government encouraged nepotism. The Congress leaders alleged that it was always during the SAD government that development of the border state regressed irreparably. Peasants, labourers, small traders and the educated youth all were disillusioned with the government, they said. “Let Badal play the semi-final match, we will definitely win the final match and form the next government,” declared Bhattal amid applause by the audience. Badal claimed that the SAD was all set to make a clean sweep and the “stooges” put up by “Amarinder and party” under the garb of the Panthic Morcha were not in a position to face the SAD-Sant Samaj combine in the SGPC polls. Meanwhile, Sukhbir said now ordinary people of Punjab don’t need to be scared of entering police stations, which were undergoing a massive change under the refreshed state government-initiated community policing programme. “The atmosphere at the police stations, which will now be known as ‘Sanjh Kendras’ will set an example of the police-public interaction. These centres will also provide counselling service to resolve disputes. The programme is going to take off from October 1,” said Sukhbir. “Captain was responsible for pushing Punjab deeper into the debt trap as out of Rs 65,000 crore state debt, the Amarinder Government had taken debt of more than Rs 19,620 crore,” alleged Sukhbir. According to information, the incident occurred at about 2.30 pm when 12 students were heading home after the school in the van. Four of them were seriously injured and immediately rushed to the Civil Hospital, Nakodar, from where they were referred to Jalandhar. 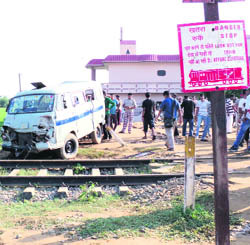 SHO Surinderpal Singh claimed the van got stuck in the slush alongside the track and was subsequently hit by the train. 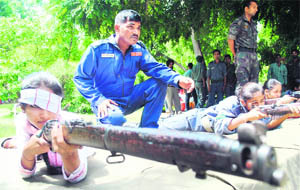 Those killed include siblings Erica (11) and her brother Abhishek (4), of Mauwal village, and Kirandeep (9). While Kirandeep died on her way to hospital, the siblings succumbed to their injuries at the Jalandhar hospital. Blaming the railway authorities for the mishap, the villagers who gathered on the spot claimed they had time and again requested the authorities in Ferozepur to convert the crossing into a manned one. They also staged a dharna. Assistant Commandant, RPF, Ram Badan Rai, said a probe has been ordered. A case of negligence has been registered against the van driver, Lankesh, who too has sustained serious injuries and is admitted at the Civil Hospital. n	In a similar mishap in 2005, two schoolchildren of Uppal Khalsa village in Noormahal died when the DMU train hit their van at an unmanned railway crossing. n In November 2006, three girls of PTM Arya Girls College in Noormahal were killed in a same manner at an unmanned crossing at Gumtala, near Bilga. Siblings Erica and Abhishek were sitting together on the hind seat of the van, coming back from Mallavi Devi DAV Public School just a km away. They probably were the ones to face the maximum impact of the accident that claimed three lives and left three other children seriously injured. “The doctors at the emergency ward of the Civil Hospital took more than 25 minutes to attend to her. 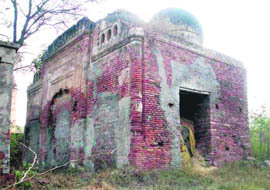 During this time, she was at the disposal of the ward boys,” said Bhatti. Rahul, who sustained injuries, hails from a poor migrant family from Rajasthan. His parents, working as gardeners in a nursery, could not even reach the hospital even four hours after the accident. He was being taken care of by some city-based relatives. Sajal Sood’s father Deepak Sood, who runs a shop in Nakodar, said his son had received a fracture in the left leg and was under treatment. “My younger son had returned home safe in another van,” he said. CMO, Railways, Dr Kataria confirmed that three children had passed away and three children were still under treatment in the hospital. 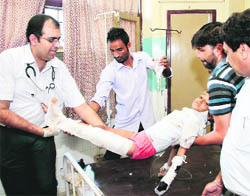 Dr HK Singla, Civil Surgeon, said the three other children seemed stable and were under observation. Mishri Khan from Pakistan was killed in a clash between two groups of workers involved in bootlegging in Sharjah in 2009. Early last year, all 17 Indian boys were sentenced to death for murdering Mishri Khan. “It is a very happy occasion for me and all those who have supported the cause of these boys,” said a jubilant SP Singh Oberoi, a Dubai-based businessman, who was instrumental in helping the youths is escaping the gallows. He paid a major share of the blood money to Mishri Khan’s family. Punjab Congress chief Amarinder Singh also chipped in both with financial and moral support. The boys to be released from the Sharjah jail are Sukhjinder Singh of Patti, Sukhjot Singh of Sanghera, Ram Singh of Kanvi, Amritsar, Arvinder Singh of Ghokulwada, Gurdaspur, Baljeet Singh of Sangwal in Jalandhar, Daljeet Singh of Aitiana in Ludhiana, Dharampal Singh of Jhoke Tehal Singhwala in Ferozepur, Satgur Singh of Khanaur Jattan in Sangrur, Satnam Singh of Koolikalan in Ludhiana, Kashmir Singh of Rattu Ke in Tarn Taran, Suban Singh of Lohian Khas in Kapurthala, Kulwinder Singh of Bansipura in Ludhiana, Kuldeep Singh of Kukrana in Moga, Sukhinder Singh of Nikki Miani in Kapurthala, Namjyot Singh of Raikot in Ludhiana, Harjinder Singh of Phagwara and Taranjit Singh of Kaithal, Haryana. In March last year, an appeal was filed on behalf of the convicts by a battery of lawyers engaged by the Consulate-General of India in Dubai. While the hearing of the appeal was on, the Appeal Court asked the defence team if it was open for settlement with the family of the victim under the “Diya” law. Though the lawyers maintained that they had a foolproof case, they informed the court that they would go by the directions from the Consulate-General of India.Later, the court was informed that defence lawyers had no objection to the settlement between the families of the victim and those convicted. After a series of meetings, the victim’s family,finally, agreed to accept the blood money and “pardon” the convicts. The settlement documents were submited in the Appeal Court last month and the final order was announced today. The court, after a brief hearing, pronounced the order, thus paving the way for early release of the youths. Since they had undergone imprisonment for more than three years, their revised sentence of a two-year jail term for other offences, including bootlegging and rioting, was taken to be completed. Meanwhile, the government has clarified that the list of 109 municipal committees that would benefit from the grant included 11 municipal committees where the BJP had a stronghold. It had been inadvertently mentioned in the earlier report that these committees had been left out. Sources said the Amritsar, Jalandhar and Ludhiana corporations would not get any grant. The grant is expected to be released in two instalments during October and November. In light of the announcement the BJP leadership is mincing no words in saying that the leader of the BJP in the Vidhan Sabha, Tikshan Sud, has managed to get a grant of Rs 14 crore for the Hoshiarpur MC which is his own constituency, but failed to plead the case of other urban areas. The lawyers to be elevated are R N Raina, N K Sanghi, Rameshwar Malik, T S Dhindsa, P S Dhaliwal and Gurmeet Singh Sandhawalia. The advocates will now undergo medical examination and other formalities before their warrants of appointment arrive and they are administered oath. The oath-taking ceremony is likely to be held within a week. The oath will be administered by Acting Chief Justice M. Kumar, if Chief Justice Ranjan Gogoi does not join the High Court by then. After this, three more advocates will be elevated. They are Suvir Sehgal, Sunil Chadha and JS Puri. The file carrying their names is pending before the Apex Court collegium. With the elevation of the six advocates, the number of Judges will go up to 48. Even after their elevation, the vacancies of Judges in the High Court will remain as the sanctioned strength is 68. As of now, the High Court has approximately two lakh pending cases. The list of six advocates, forwarded by outgoing Chief Justice Mukul Mudgal at the fag-end of his tenure, had reportedly hit a hurdle. Indications are that the list was again placed for review before the High Court collegium headed by Chief Justice Ranjan Gogoi. The roadblock was removed only after Chief Justice Gogoi gave the nod to the list. Apart from Govind Singh Longowal, three more candidates are trying their luck from the constituency: Avtar Singh Kallar (SAD-Mann), Rajinder Singh Kanjili (Panthic Morcha) and Shamsher Singh Tungaan (Independent). Longowal (general) seat has 43,220 voters and about 70 per cent of them are females. Govind Singh mostly has a hectic schedule lined up for the day, which he plans a day in advance. He starts his campaigning at 6 am by going door to door. Following this, he addresses public meetings between 9 am and 4 pm. Then follow the meetings to discuss poll strategy. It’s only by 9 pm that the 50-year-old is able to get back home. But there too, he has voters lined up to meet before he can retire for the day. “Longowal taught me a lot. He always loved the people…. I will carry forward his legacy,” he avers. He claims he got completed the work of Kaimbowaal Gurdwara, which was started by Sant Harchand Longowal in the 1980s, built school, colleges and roads during his tenure as Irrigation Minister from 1997 to 2000. However, Kallar is not impressed by Govind Singh’s “Mr Clean” image and accuses him of corruption in the management of gurdwaras. “A local resident, Mela Singh, has even filed a case against Govind Singh for indulging in corruption at a gurdwara,” he added. In the last SGPC election, Gora managed to beat his nearest rival by a margin of 36,000 votes, a factor that perhaps is responsible for the confidence that Gora exudes while saying that “he would script yet another success story”. Two more candidates are in the fray: Hardeep Singh (SAD-Amritsar) and Mehan Singh (SAD-1920). There are 70,647 voters in 56 villages and the Gidderbaha town. Already, Gora is through with the first round of his campaigning in the entire constituency and has covered 16 villages in the second round. Showing little faith in door-to-door canvassing, Gora does not believe in “making promises either”. “I win because I deliver,” he says. In his second term, he avers, he got opened an SGPC school at Therri Bhai Ke village (near Gidderbaha). His agenda: fulfillment of his religious duties. Meanwhile, people in Gidderbaha speak in favour of Gora despite the area being the stronghold of People’s Party of Punjab supremo Manpreet Singh Badal. Some of them claim that even Manpreet was not opposing the sitting SGPC member. However, the PPP chief could not be contacted as he was away to Delhi. Two more persons, Sukha Singh and Mukhtiar Singh, from the same village are under treatment at the local Columbia Asia Hospital. Condition of Sukha Singh is said to be critical. Talking to The Tribune, village sarpanch Balbir Singh informed that the incident had shaken the entire village and people are panicked about the spread of the deadly disease. He further alleged that many more families in the village were suffering from high fever but they were yet to get the tests done. “We have also alerted our doctors in the entire district to ensure that no such cases are taken lightly. Even the health workers have been asked to keep an eye on such incidents and immediately report it to the health officials, so that preventive measures could be taken,” she added. Notably, the department had completed the DPC on August 13 for the promotion of around 900 masters. There are 1,665 posts of headmaster in government high schools throughout Punjab, out of which 1,147 are vacant, which means nearly 69 per cent seats are vacant. These seats have been divided into two categories - 75 per cent for those masters who would be promoted to headmasters and 25 per cent for direct recruitment. Sources informed that the department concerned had presented a final report to the Secretary, Education, within four days of the completion of the DPC but till date these cases have not been cleared. Talking to The Tribune, one of the teachers said they had got information about the completion of the DPC but were still waiting for the letters. “Once the letters are issued, only then we could send our requests regarding allotment of particular stations in the state. This delay is certainly disappointing as we have been waiting for long now,” he added. The development is significant as nothing less than 29 petitions were filed challenging the appointments. The allegations were that the appointments were made in a hush-hush manner, “without verification of the antecedents of the candidates”. At the time of selections, at least two of the candidates were relatives of MLAs. One of them was the son of a Superintending Engineer, while another was a close relative of a Panchayati Raj Additional Director. A candidate was also a close relative of the then Chairman of Punjab Agro Industries. It was also alleged that another candidate was brother of a Block Development and Panchayat Officer. Yet another candidate was the relative of a Parliamentary Secretary to the Punjab Government. 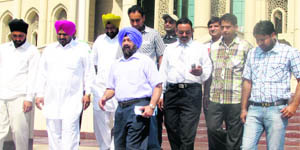 Dismissing the petitions by Dharam Pal Sharma and other petitioners against the State of Punjab and other respondents after hearing Punjab Additional Advocate-General AS Grewal, Justice Sabina asserted: “The allegations levelled in the petition qua appointment of relatives of politicians/bureaucrats to the posts of SEPOs have been duly denied by the State in the written statement. “No replication has been filed to counter the denial. In these circumstances, it cannot be said that the selected candidates were closely related to politicians/bureaucrats. Moreover, there is nothing on record to suggest that any influence had been yielded by the successful candidates at the time of their selection to the posts of SEPOs”. candidates are continuing in service for the past many years. Out of the selected candidates, four candidates have since died and their families are getting family pensions. “Moreover, it would not be just and equitable to disturb the appointments made long time ago in pursuance to the selection.…”Keeping in view the totality of the facts and circumstances of the present case, the present writ petitions are liable to be dismissed”. With today’s arrest, three of the four accused, including BJP councillor Rajbir Singh Bhullar and his accomplice Jarnail Singh, a Punjab police head constable — the duo arrested yesterday — have been taken into custody. Yadvinder Singh Bhullar, brother of the main accused Rajbir Bhullar, is still at large. Gill was gunned down in broad daylight in front of the busy court complex, barely 50 metres away from the SSP’s residence, on Friday. Batala SSP Gurkirpal Singh said several teams had been constituted to nab Yadvinder. Bajwa’s arrest, however, remains shrouded in mystery as a top police official on anonymity disclosed that the accused surrendered before the cops last evening. But officials say he was arrested following a raid. Also, the Gurdaspur NRI unit’s executive committee held a meeting and condemned the murder.